The Annual General Meeting (AGM) of the University of Toronto Students’ Union (UTSU) took place on October 30. What was made clear to attendees was that, understandably, the UTSU is focused on the future — which means reigning in the Student Commons and the financial deficit stemming from it. However, if the UTSU wants to maintain students’ trust, it must accept that the impassioned population that actually attends UTSU meetings may not entirely agree with campaign promises. This is especially the case when efforts to preserve financial security come at additional costs to students. The UTSU finds itself scrambling to cut costs to salvage the Student Commons, a project it has referred to as a “dumpster fire.” There is no question that the Student Commons is putting the UTSU in a difficult financial position. At the same time, according to a blog post on the UTSU site, if the Student Commons continues to run a deficit four years after opening, U of T will reclaim management of the building and possibly force the UTSU to vacate it. The UTSU is not forever bound to maintaining this building — and it will inevitably run a deficit, regardless of the services and executive positions it cuts. The UTSU’s attitude toward this project amplifies students’ frustrations with the project itself, given the financial sacrifices students are forced to make to construct and maintain a building that apparently no one wants. At the end of the day, it is student money that continues to go toward this project, and the UTSU’s apparent cynicism is discouraging. Really, the union has an attitude problem. If it continues to position the Student Commons as a burden, then why should the student body be willing to support it, especially at a cost to student services? Let’s remember that the Student Commons is not just a “dumpster fire.” There are benefits to a new student space that the current UTSU team is not clearly explaining to students. It is important for students to understand why exactly it is necessary to make budgetary cuts to accommodate the Student Commons. This is all the more important given the UTSU’s apparent failure to consult with its constituents, which was a source of criticism at the AGM. One proposal was raised to merge two executive positions, Vice-President University Affairs and VP External, into a VP Advocacy position — largely to cut costs. There was concern among those opposing the proposal that combining these two positions would sacrifice student services to finance the Student Commons, a project that the current UTSU does not even seem to support. The UTSU had no contingency plan should the VP Advocacy proposal be voted down, but given the opposition from students, this proposal should not have been the only option. Additionally, despite the UTSU also being responsible for representing UTM students, only four UTM students were in attendance at the AGM. University of Toronto Mississauga Students’ Union President Salma Fakhry pointedly reminded UTSU executives of the exclusionary nature of scheduling proxy sign-up during UTM’s reading week. UTSU President Mathias Memmel, in turn, explained that the online sign-up process was specifically meant to improve accessibility for all students. Fakhry reminded Memmel of the UTM community’s preference for face-to-face interaction, which the UTSU did not seem to consider. But it is too early to say whether the new UTSU purposely excludes dissenting groups or if it is just having a difficult time connecting with them. However, it is evident that important voices are not being heard. It is unacceptable to blame a lack of UTM student turnout on the UTMSU’s failure to organize; the AGM was a UTSU event, and it was necessary for the UTSU to adequately promote it on both campuses. The UTSU encompasses UTM students — they must be afforded the same level of access to UTSU meetings as UTSG students. While the financial toll of the Student Commons greatly affects students, the UTSU needs to do a better job of communicating why it is such a significant issue to both UTSG and UTM students. Otherwise, the project will continue to be perceived as a mistake that we are forced to pay for. As the union’s Vice-President Professional Faculties Ryan Gomes put it, Thursday’s University of Toronto Students’ Union (UTSU) Annual General Meeting (AGM) was one of the most “civil” in a long time. To the noted surprise of the executives, the chair, and the members alike, the meeting was remarkable precisely for its lack of controversy, unlike the AGMs of previous years. It was called to order at 6:45 p.m. and adjourned at 8:35 p.m. Past meetings have been marked by disruptions, long delays, and divisive motions. Following introductory remarks on procedure and equity, the meeting began with a 25-minute presidential address and question period with UTSU President Jasmine Wong Denike. Denike outlined various UTSU initiatives and campaigns. She argued that the UTSU has been responsible with their funds and stressed the importance of holding the union accountable. There were also three motions on the agenda, one of which was an omnibus motion to apply all of the bylaw amendments made by the board. All of the motions carried. University College Literary and Athletic Society Vice-President Daman Singh moved an amendment to the bylaws 6.2 concerning the Elections and Referenda Committee’s ability to call multiple ratification meetings. This sparked debate over the democratic process of the UTSU and clarification on the proposed appellate board’s purpose as part of the bylaws. Singh spoke to The Varsity following the AGM, bringing up last May’s contentious annual ratification meeting. The bylaw amendments also establish an Appellate Board, which would hear any complaints a student would have about the election beyond the Elections and Referenda Committee. According to the text of the bylaw, the Appellate Board “shall be limited to the hearing of appeals and disciplinary decisions form the Grievance Officer the Elections and Referenda Committee, and the Executive Review Committee,” and that all decisions made by the board are binding on the UTSU. The other two motions concerned the budgeting process; UTSU Engineering Director Andrew Sweeny’s motion makes the UTSU earmark at least 25 per cent of its gross revenue to clubs, events, and services while VUSAC Vice-President Stephen Warner brought a non-binding motion to have the operating budget specify the amount that the union distributes to each of its levy groups, which include LGBTOUT, BikeChain, Downtown Legal Services, and others. 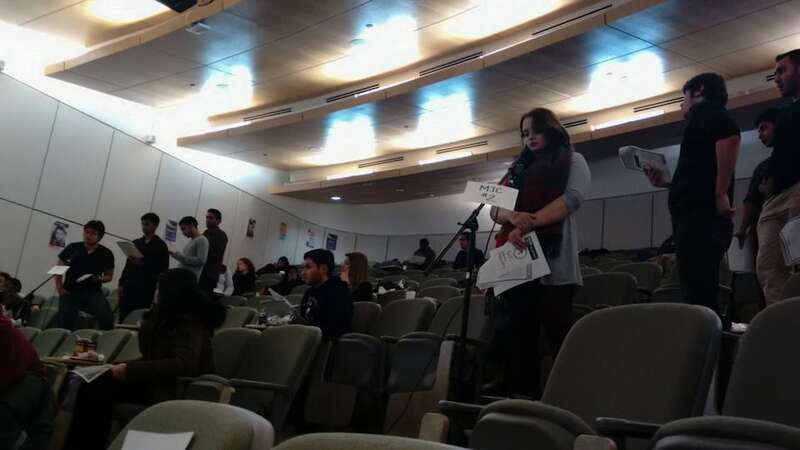 Students came to discuss a number of issues at the Scarborough Campus Students’ Union (SCSU) Annual General Meeting (AGM), but only eight were addressed before the meeting adjourned early. The meeting, which began on Wednesday, November 18, lasted four hours and saw seven motions passed. One motion that would have changed the vice-president, operations of the SCSU from an appointed to an elected position was the only motion to fail. VP Operations: appointed or elected? The most contentious resolution of the meeting was a motion to change the selection of the vice-president operations position from a hired to an elected one. SCSU president Nicole Dionisio, the mover of the motion, began the discussion. She explained that the motion was proposed because the role of the vice-president operations has transitioned from being primarily business-focused role to a more services-oriented one. Dionisio said that a full-time staff member had been hired to help monitor the SCSU’s finances and operations, leaving the vice-president operations free to focus on reaching out to students, without needing a strong financial and operational background. However, many students questioned the feasibility of the vice-president not requiring training or background in finance or management. Students listed several of the vice-president operations’ responsibilities, including accessing all financial records and presenting the budget. Some students worried that a ‘popularity contest’ would not suffice in ensuring the capabilities of the person appointed. Furthermore, students mentioned that the voter turnout for SCSU elections is extremely low, with less than 10 per cent of the student body participating. Govind Mohan, the resource co-ordinator of the UTSC Young Liberals and communications executive with the UTSC Film Club, and Syed Sajeed Bakht, a second-year computer science student spoke against the motion. “The SCSU is a $5 million organization, which, in the wrong hands could face appalling consequences, even without any malicious intent,” they later told The Varsity in a joint email. The motion required a two-thirds majority vote to pass, which it did not meet. SCSU did not respond to The Varsity’s request for comment. Several motions to amend the SCSU’s by-laws, including by-laws pertaining to the removal from office, committees, and executive responsibilities, all passed without much discussion. Motions for improved multi-faith space and scheduling, as well as a motion condemning the Trans Pacific Partnership (TPP) also passed. The motion for a Racialized Student Collective, however, was contentious. It proposed the creation of a collective with an anti-racist mandate that would organize campaigns to combat oppressive systems, as well as provide a safe space, called the Equity Service Centre, for students to discuss their experiences. Some students arguing against this motion were concerned about the inclusivity of the proposed space, while others worried about the opportunity cost, wondering if the space would always be active. Those supporting the creation of this collective assured that non-racialized students wouldn’t be barred from the space and that the space in question, SL-210B, is largely under-utilized, stressing that the space would not be wasted. After further discussion, the majority voted in favour of the motion. Five motions, those calling for Syrian refugee support, for South African solidarity, for a website update, for livestreaming the SCSU AGM, and for SCSU holding an open public forum at the end of the year, were not debated or voted upon, because the meeting lost quorum. The meeting was adjourned during discussion on the motion asking for the SCSU to donate $500 to the Syrian Refugee Crisis. Aziz, the mover of the motion, was extremely upset. She believes that the SCSU should cap the AGM at four speakers per motion, saying, “The debates went on far too long and by the time my motion came up, it was the fifth hour and people just wanted to get up and leave — no one cared anymore.” Aziz said that she does not blame the SCSU, remarking that the union has been extremely supportive of her campaign. There are three options for the remaining motions: they can be moved for discussion at the next year’s AGM, the Board of Directors can call for another General Meeting this year, or the motions can be brought to the Board of Directors who would vote on them. Aziz said that her motion will be brought to the next board meeting, where she has been told there is a high chance it will pass. Renee Ball, president of the UTSC Young Liberals and an upper year representative for the Political Science Students Association believes that, overall, the meeting was conducted professionally and impartially. However, she, Aziz, Mohan, and Bakht all said that the meeting began too late and ran too long. Aziz commented that students did not anticipate the meeting lasting longer than two-to-three hours, and that the executive report and financial report reading took about two hours, not leaving enough for discussion of the motions. Students vote at the 2015 UTMSU AGM. Courtesy UTMSU. Financial status, new initiatives, and services were the prime talking points at the University of Toronto Mississauga Students’ Union (UTMSU) Annual General Meeting (AGM). 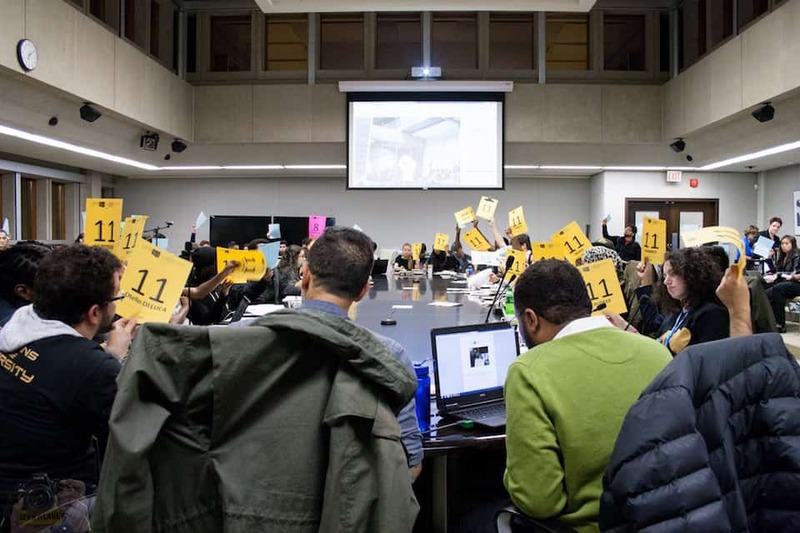 The November 12 meeting also offered an opportunity for UTM students to discuss proposed projects and potential changes to the union. Some of the major achievements discussed at the AGM were the addition of a second student to the World University Service of Canada (WUSC) program, a partnership with youth employment services to help recent graduates with job prospects, the opening of UTM’s first student-run convenience store, and the first mature students’ orientation. In the past, the WUSC program has always been able to secure a space for one refugee student at UTM, who is granted an all expenses paid four-year stay on campus. According to Naveed Ahmed, UTMSU vice-president external, UTM succeeded in providing for a second Syrian refugee student amidst the ongoing crisis. Amir Mozzami, UTMSU vice-president part-time affairs, spoke about the new initiative with youth employment service. He expressed that the aim was essentially to strengthen graduate students’ professional networks by connecting them with employers in their preferred industry. Mozzami said that this was something the union has wanted to do for many years, and that the project is still in its beginning stages. The Duck Stop, UTM’s new convenience store, has officially opened and is currently located under the UTM Multi-Faith Centre. Francesco Otello-Deluca, UTMSU vice-president internal & services, mentioned that this store sells items at prices that are student-friendly. The union held their first mature students’ orientation this year. With over 200 students registering, Mozzami described the pilot project as a success. Nour Alideeb, vice-president university affairs and academics, mentioned an initiative to raise student awareness on the academic policies by having student rights included on syllabi and using infographics to break down policies in an accessible way. Some of the other services and initiatives discussed included various environmental initiatives such as farmers’ markets, community kitchens, and tree planting. International student initiatives included events such as a meet and greet and a free grocery trip service. For the 2014–2015 fiscal year, the UTMSU reported a budget surplus of $271,000, bringing overall net assets to $1.4 million. The Blind Duck, the UTMSU student pub, recorded a deficit of $32,000. Otello-Deluca attributed this shortcoming to external factors such as the strike and the implementation of new food services on campus. He believes the deficit was a one-time occurrence. Perhaps the most significant amendment made was to remove the position of vice-president, part-time affairs. The motion was proposed on the grounds that the UTMSU executive believed that the current representation on the executive, combined with that of the Association of Part-time Undergraduate Students (APUS) and their move to hire more staff dedicated to part-time students, was sufficient to account for the needs of their part-time student population. Other amendments made targeted updating the UTMSU by-laws and policies as, according to Agbeyegbe, they had not been updated since 2009. In the discussion that ensued after the UTMSU executives had each delivered their reports, Jasbina Sekhon, UTMSU LGBTQ coordinator, expressed the need for additional funding to hire a trans coordinator, as well as create a trans and gender-variant student collective. “I’m a trans person, and I feel that our students aren’t being served the way we could be served,” they remarked. Sekhon advocated for a space where students can meet and be supported and elaborated on the kinds of issues trans people face, ranging from systemic issues with staff and professors to transphobia and transmisogyny. They mentioned the existence of such a collective at other campuses including Ryerson and U of T’s St. George campus. “I want to have something for trans, non-binary, and gender diverse students who know that there is a space for this community to collectivize and grow; we need to be progressive, we need to do more for our students,” they said. Jay Gonzalez-Tinoco, another trans student, agreed with Sekhon, furthering the argument for the need of transgender accommodations, such as gender neutral washrooms. Another issue brought up was parking fees. Dwayne Beckford, a first-year UTM student, asked for more regulation on the high parking prices; Mozzami mentioned that while the UTMSU acknowledges and is working on the issue, it is a difficult issue to win over due to barriers faced with authorities. After more than two years and three general meetings, the University of Toronto Students’ Union’s (UTSU) journey to ratify a new Board of Directors structure has finally concluded. With 2,076 votes in favour, 44 opposed, and one abstention, a modified version of the board structure proposal submitted by Arts & Science director Khrystyna Zhuk and University College director Daman Singh was ratified at the UTSU’s Special General Meeting (SGM), otherwise called AGM Part 2, on Wednesday November 18. The final board structure preserves proportional representation for colleges and professional faculties. However, these directors will now be elected internally by their respective divisions. Additionally, the Arts & Science at-large directorships have been replaced by six program directors. The position of vice-president professional faculties has been created and the vice-president campus life is now an elected position. As a federally incorporated not-for-profit organization, the UTSU had to change its board structure in order to comply with the new regulations outlined under the Canada Not-for-profit Corporations Act (CNCA). The CNCA replaced the Canada Corporations Act, which previously governed the UTSU. The UTSU’s first attempt to approve a CNCA-compliant board structure proposal was at the October 2014 AGM. There was only one proposal on the agenda, and details of the proposal included the elimination of college-based directors, instead granting representation to colleges via a committee, and the introduction of directors tasked to represent issues facing various marginalized groups. The controversial proposal ultimately failed to meet the two-thirds requirement during the vote to ratify. 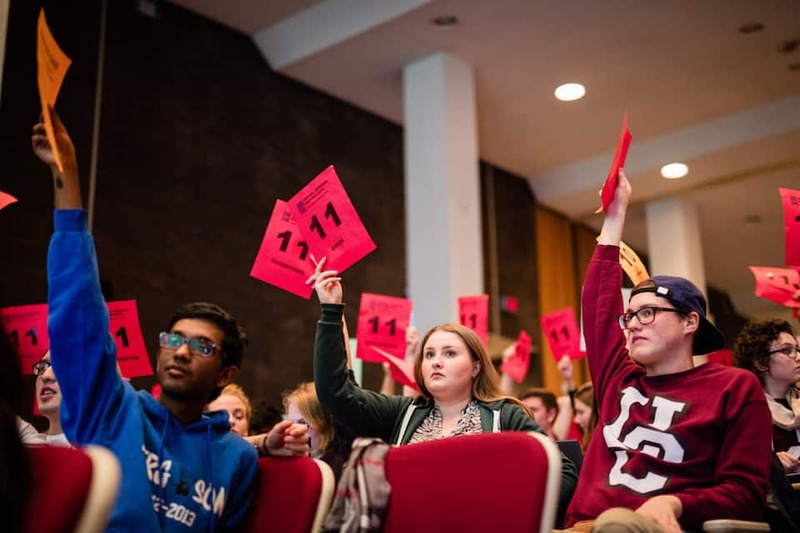 This year’s AGM, held on October 7, saw two competing board proposals: one moved by Zhuk and seconded by Singh; the other moved by former UTSU vice-president external Grayce Slobodian. The Zhuk/Singh proposal included the preservation of all directors representing colleges and faculties. Various student societies as well as the UTSU Board of Directors also endorsed the proposal. Slobodian’s proposal would have reduced the number of directors for each college and professional faculty to one, while increasing the number of UTM directors to eight and implementing ‘constituency directors’ to represent marginalized groups. During the meeting, the Zhuk/Singh proposal beat Slobodian’s proposal in the board structure election, but did not meet the two-thirds majority at the time of ratification. A modified version of the Zhuk/Singh proposal was brought back for consideration at the November 18 SGM. The modifications included amendments that were moved from the floor at the October 7 AGM. There are now seven ‘general equity’ directors, after Jades Swadron, organizer with the Trans Inclusivity Project, amended the proposal on the floor of the AGM to include a poverty sub-commission and an additional director to chair it. Former Computer Science Student Union president Jonathan Webb moved an amendment during the November 18 SGM. Webb’s amendment replaced the two Arts & Science at-large directors with directors representing each of the six programs under the Faculty of Arts & Science (humanities, social science, life science, computer science, physical and mathematical science, and Rotman commerce). “So, when you’re in first year, it’s based on your enrollment category. Whenever you apply, they ask you what you want to study and each of those come to one of six enrollment pools,” explained Webb. “And then, past that, every single degree is dumped into one of these buckets. If you’re taking a major or specialist in one of these degrees, the plan is that you’ll be able to vote for them.” Webb clarified that the specific details on how these directors will operate still needed addressed by the UTSU’s Elections and Referenda Committee. Some students, however, opposed Webb’s amendment. Arts & Science Students’ Union (ASSU) executive Natalie Petra said that the program directors would duplicate the representation that the ASSU already offers. “Right now, this amendment is creating double representation,” said Petra during the SGM. Petra also explained that the ASSU liaises with the UTSU vice-president university affairs and talked about the work that the course unions do. However, Webb disagreed. He told The Varsity, “I think that these seats do nothing but to compliment the [ASSU]. The same argument being made against the academic seats could be said against the Arts & Science at-large seats. They effectively serve the same purpose. We’re just dividing them up differently right now.” Ultimately, Webb’s amendment passed with 1,088 votes in favour, 182 opposed, and 942 abstentions. Many students left the SGM feeling relieved that the seemingly endless debate over board structures was finally over. UTSU president Ben Coleman told The Varsity that the union would be able to focus more on advocacy with the board structure debate now out of the way.